Small Fluted Bowl. 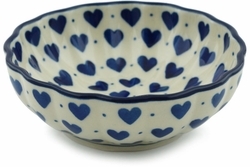 Polish pottery fluted bowl is made of high quality stoneware. Each stoneware bowl is hand crafted at famous Ceramika Artystyczna factory where artisans rely on time-honored techniques to meticulously decorate it by hand. The hand-painted surface is scratch resistant, durable, hygienic and easy-to-clean. These multi-purpose bowls can be used to serve for serving salad, pasta or whatever else you may have on the menu. This low, wide pottery bowl is perfect for the dinner table.